Troubled from the onset by cast changes and sponsor discontent, “The Californians”, which began 9/24/57, was a half-hour series designed by executive producers Louis F. Edelman and Robert F. Sisk as an ongoing-storyline western epic not unlike their previous successes, “Wyatt Earp” (‘55-‘61) and “Jim Bowie” (‘56-‘58). This time they concentrated on the discovery of gold in California in 1849 and the vigilantes who kept order in lieu of real law in rowdy boomtown San Francisco, circa 1851. 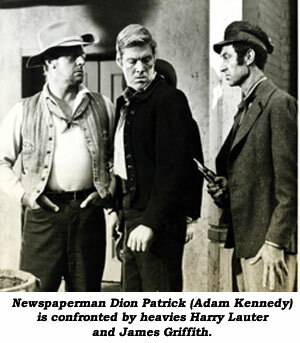 The original stars of the Tuesday night series were Adam Kennedy as Irish prospector turned newspaper reporter Dion Patrick, often at odds with Irishman Jack McGivern (Sean McClory), vigilante leader who also ran the general store with his wife Martha (Nan Leslie). Herb Rudley played newspaper owner Sam Brennan. “We wanted to get away from the cliché of the ‘gunslinging marshal’,” said the line producer Robert Bassler. By the middle of the first season, the show’s sponsors (Singer Sewing Machines and Lipton Tea) became uneasy with the glorification of vigilantes and pressured producers to make a change. The cry went out for Kennedy’s scalp. Sean McClory remembered for us, “I think what they were not happy with was Adam Kennedy. They didn’t consider him a very good actor—or appealing. So, he was fired. Kennedy and myself were both getting the same amount of money. They brought this guy Coogan in from New York, whom I’d never heard of—and nobody else seemed to have either. Apparently, he was Capt. Video in N.Y. in some space series. They said he’s going to be the lead now because the sponsors want an All-American Boy…but you’re going to still be in it as the second lead. I said, ‘No—No—No, I don’t see it that way at all. I’m much better known than this guy and I’m afraid I’m going to have to ask for the same billing, if not top billing.’ The producers were very nice people, especially Felix Feist, who was from the big New York musical publishing family. He was there before Coogan came from New York. He and I became very big pals. Subsequently, I directed some of the episodes.” One of McClory’s directorial episodes was “Overland Mail” (10/28/58). By December ‘57 Bassler had withdrawn and was replaced as line producer by Felix Feist who had previously directed several episodes. “The sponsors took a very paternalistic attitude,” explained Feist. “They examined every comma with a microscope. They didn’t want to offend a single customer.” Memos began to appear to avoid violence before the commercial as it might impair the audience’s buying appetites…and mustn’t use the phrase “in the soup” as it might reflect unfavorably on Lipton. Kennedy was fired and McClory’s vigilante character was relegated to a recurring role. 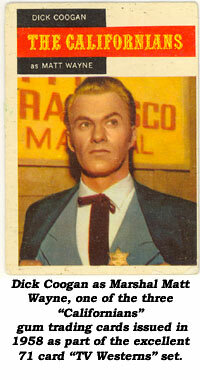 Episode #23 (“Gentlemen From Philadelphia”, 3/4/58) introduced Richard Coogan as newcomer Matt Wayne who bought a saloon, then accepted the post of marshal of San Francisco in the 3/11/58 episode when a friend is gunned down. 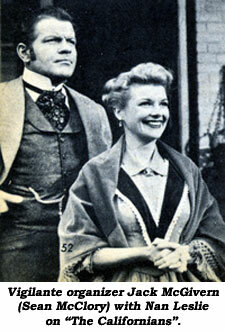 Matt Wayne gained a love interest in the 4/1/58 episode (“J. Jimmerson Jones, Inc.”) when Carole Mathews joined the cast as widowed Wilma Fansler, who ran a gambling house. 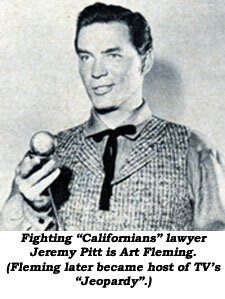 As the second season began (“Dishonor for Matt Wayne”, 9/23/58), Arthur Fleming as lawyer Jeremy Pitt joined the cast and Matt Wayne commanded a 50 man police force fighting crime and corruption on the Barbary Coast. Although Coogan was a stronger lead than Kennedy, with continued sponsor interference, Matt Wayne’s Rhett Butler-like character traits began to evaporate and stories became more routine until Coogan and the series became indistinguishable from all other TV cowboys. The catchy title tune, “I’ve Come To California”, was sung by the Ken Darby Singers, whom producer Lou Edelman used to sing the theme to his previous hits, “Wyatt Earp” and “Jim Bowie”. 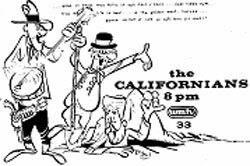 Harold Adamson (words) and Harry Warren (music) wrote both Earp and “Californians” tunes. The series was produced by California National Productions for NBC. The former Miss Chicago, Carole Mathews (born September 13, 1920, in Illinois), came to Hollywood as an Earl Carroll showgirl in ‘39. She became a Columbia pictures contractee from ‘43-‘45 then freelanced on into the ‘60s when she got into the travel bureau business and raised miniature horses. Today Carole is retired in Murrietta, CA. Prior to “The Californians”, Adam Kennedy worked as an illustrator for ESQUIRE in the late ‘40s and became a well known abstract painter in the ‘50s as well as a popular male model (‘53-‘55). Upon leaving the series he became a successful novelist, penning some of his first 20 novels under the pseudonym John Redgate. He wrote DOMINO PRINCIPLE, which he turned into a hit film for producer Stanley Kramer (‘77). Kennedy co-scripted “The Dove” and “Raise the Titanic”. Kennedy died 10/16/97. Arthur Fleming later hosted “Jeopardy” for over 10 years. He died of cancer 4/25/95. Sean McClory, born in Dublin, Ireland March 8, 1924, was in scores of western film and TV series whenever the part called for a true Irishman. Long married to well-known radio actress Peggy Webber, McClory died December 10, 2003. 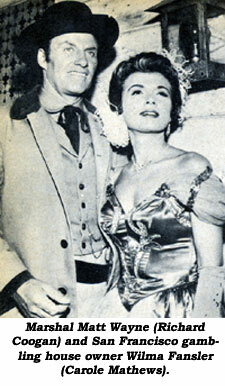 The former RKO Tim Holt co-star, Nan Leslie, died at 74 July 30, 2000, in San Juan Capistrano, CA.